Yahoo has been struggling quite a bit as of late, there’s no denying that. With big changes made by the CEO, things have gone from bad to worse. Now there’s rumors that the company may be putting itself up for sale. The rumors surround a new independent committee the company has formed. Today, we’ll talk about the new committee, whether or not I believe YHOO is putting itself up for sale, and what we can expect to see from the stock moving forward. Yahoo recently announced that the company has formed an independent committee that will be called the Strategic Review Committee. According to YHOO, the committee was created in order to determine what strategic alternatives the business should take moving forward. This comes after a slew of layoffs at the company. In fact, just yesterday, YHOO laid off a massive amount of employees associated with the online magazine. Nonetheless, that’s a different story entirely; so, let’s get back to the Strategic Review Committee. The independent Strategic Review Committee, as mentioned above, was put together to discuss strategic alternatives. To do so, Yahoo has brought on investment bank Goldman Sachs and JPMorgan to do the financial advising. These are the two big players in the committee. It’s also why the question, “Is YHOO selling itself?” is popping up. After all, when companies plan on selling, they generally hire investment banks to ensure that they are getting the best deal and that the sale goes through smoothly. Sure, there are other reason to bring the banks on board, but setting up for an acquisition definitely makes a ton of sense. Is YHOO Preparing To Be Acquired? This is the million dollar question my friends… quite literally in fact. After all, nothing seems to move the needle on a stock quite like plans of being acquired. So, is Yahoo really setting up to be acquired? In my opinion, the answer is yes! The reality is that YHOO has been struggling for quite some time. The CEO of the company has seemingly done nothing more than laying off employees in an attempt to cut costs as well as setting up a completely unfair plan for the company that seemingly justifies the layoffs based on a points system. All in all, the company is in the dumps, and one of the best ways to get the shareholders the value they deserve from the stock, and one of the few ways at that, would be an acquisition. Moving forward, I believe that we’re going to see relatively bullish movement from Yahoo; not because the company is going to come up with a grand scheme to turn things around, but because a sale is likely on the horizons. As mentioned above, selling the company would send the stock skyrocketing and give the investors the return they deserve for sticking around with the company for so long. Unfortunately, YHOO can’t seem to get its act together as it sits at the moment, and an acquisition seems more and more likely every day. With that said, we’ll likely see a bit of downward movement until an acquisition is announced. However, once it’s announced that the company is up for sale YHOO will finally skyrocket! 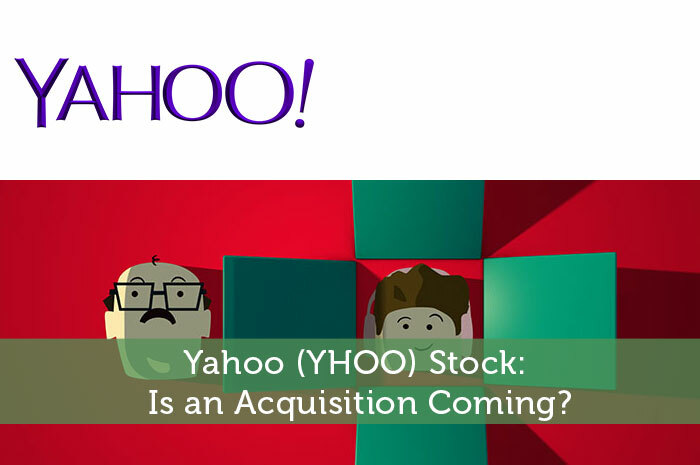 Do you think YHOO is setting up to be acquired? Let us know your opinion in the comments below! At least there is a good thing taking in consideration the fact that selling the company will skyrocket it’s price, but honestly I wasn’t expecting from Yahoo to runn so low in the last period that selling the company would be a must have.